Smaato’s Ajitpal Pannu Interviewed on The App Guy Show! Our own Chief Business Officer Ajitpal Pannu is featured on today’s episode of The App Guy podcast. Paul Kemp, a British app maker who hosts the weekly App Guy podcast, “helps app entrepreneurs take inspiration from the app journeys of others in the app world.” He interviews experts in the app development industry on a range of subjects that app developers and publishers might find useful in their own app-making journeys. In this interview, Ajitpal and Paul chat about a wide range of topics – from the various types of monetization solutions available, the best moneymaking strategies for app devs, to the recent ad-blocking dilemma that has taken the industry by storm. Ajitpal and Paul also discuss user experience, machine learning, and general pain points within the app industry. This past Tuesday, October 27th, we hosted a free webinar entitled The Union of Mobile Advertising, Data Analytics and Platforms, which featured Forrester’s Senior Analyst Jennifer Wise; our Chief Business Officer, Ajitpal Pannu, and Rocket Fuel’s Sr. Product Marketing Manager, Ian Dailey. Smaato in Full Force for this Year’s Dmexco – Come See Us! Next week Smaato will have a strong contingent in place for dmexco, one of the most important global events in our corner of mobile marketing and advertising. We’ve certainly attended and exhibited in the past, but our presence this year will be our largest yet. If you’re headed to Cologne, Germany for the show on September 16th-17th, we’d love for you to stop by. Internet Week took over New York City last month from May 18-22, and Smaato was on the ground and ready to show the world what an innovative, next-gen mobile advertising platform looks like. 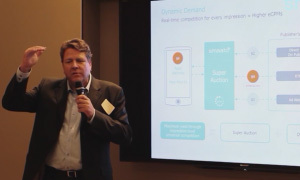 To kick off this week-long celebration of technology, Smaato hosted a Mobile Programmatic event with presentations from our CEO Ragnar Kruse, along with Microsoft's Global Sales Strategy Lead, Sharon Harris and Dstillery's VP of Analytics, Lauren Moores. To commemorate our New York team's recent move to the 42nd floor of the Empire State Building, the event was held on the ground floor of this historic building at the State Grill & Bar. March is coming in like a lion as Barcelona prepares to host the biggest annual event of the mobile industry - Mobile World Congress. With over 85,000 attendees and more than 1,900 exhibitors, Mobile World Congress is by far the world’s largest gathering of the mobile ecosystem. Whether seeking out new opportunities, getting a sneak peek of the industry’s innovations or exchanging ideas on the latest mobile trends, the mobile industry’s leading players never miss this global event. Did you miss the “Make Money with Apps” workshop in NYC on May 2nd? No worries - watch our video from the workshop and get up to speed. Smaato Chief Strategy Officer Ajitpal Pannu’s Rise of Mobile RTB presentation gives you the keys to a profitable mobile monetization strategy for your application. Every year in February the city of Barcelona becomes the Mecca of the mobile industry. In the course of four days, the mobile leaders and experts meet, discuss and shape the future of this industry. With more than 72,000 attendees and over 1,700 exhibitors, Mobile World Congress is definitely Europe’s biggest mobile event – and probably one of the biggest mobile shows worldwide. Smaato, the leading mobile ad optimization platform, continues its momentum and record growth as the company powers into 2012 setting Smaato on track to earn title as the undisputed global leader in mobile advertising.